The second season of Avatar ended on a downer: the city of Ba Sing Se has fallen to the Fire Nation, the Earth Kingdom is under enemy occupation and organised resistance to the Fire Nation has been reduced to a few guerrilla bands. However, the Avatar, Aang, and his companions are still at large and in possession of vital information: in a few short weeks there will be a solar eclipse, during which time the Fire Nation will be vulnerable to attack. A few weeks after that, Sozin's Comet will return, and the powers of the firebenders will be at their height. The Avatar must face and defeat Fire Lord Ozai during the eclipse if the world is to be saved. The board is set for a grand showdown, but our heroes still need to prepare for the final confrontation. The early part of Season 3 has our heroes infiltrating the Fire Nation, having arranged a meeting place with some of their allies. One of the benefits of Ba Sing Se's isolationism during the war was that many of its armies were left to operate autonomously, and they have enough military force left to help with an assault on the Fire Nation's capital. However, the early part of Season 3 is surprisingly focused on stand-alone episodes as it treads water waiting for the eclipse. Luckily, few arc-heavy shows do stand-alones as well as Avatar, and episodes centering on Sokka's desire to find a mentor of his own or Katara trying to save a village from pollution caused by a Fire Nation factory are more effective than they might sound, with each adding an element of character growth or humour to the series' tapestry. After a few stand-aloneish episodes, the arc reasserts itself. We learn vital backstory about the relationship between Sozin and Roku, the previous Avatar, and Katara discovers a powerful but deadly new form of waterbending. There is still time for the show's humour, however, as with the episode where Aang cannot rest before the invasion and starts having bizarre hallucinations (such as one where Momu and Appa gain the power of speech and fight a deadly sword duel whilst being cheered on by sheep). The invasion finally comes, but obviously the fact it takes place ten episodes before the end of the series is a sign that things are not going to turn out well. From this point, the former dynamics of the show reassert themselves, with Azula and her compatriots hunting down the Avatar and Zuko's torn loyalties again leading him down a different path. The second half of the season is more tense and more urgent, as the 'good guys' are reduced to little more than just our heroes and the imminent arrival of the comet inspires the Fire Lord to embark on a plan of mass destruction and genocide beyond anything we've seen before in this show. Events culminate in a massive showdown, unexpected (but cleverly foreshadowed) allies emerge and old mysteries are solved as the story reaches its epic conclusion. The third and final season of Avatar draws the storyline to an action-packed conclusion which is extremely satisfying, with enough twists and turns to avoid being predictable. As usual, the character development is exemplery, the writing entertaining and the voice acting accomplished. Criticisms? Well, there is an element of deus ex machina in the finale, although closer examination reveals it was set up earlier (a fairly obscure reference in Season 2's The Library, though), and there are a few loose ends, with some characters' fates left murky or unresolved. With the promised Avatar spin-off series apparently going to be set in a different time period focusing on a different incarnation of the Avatar, it's unclear if these questions will be answered. But if not, they at least give the fans something to debate and argue over in the future. 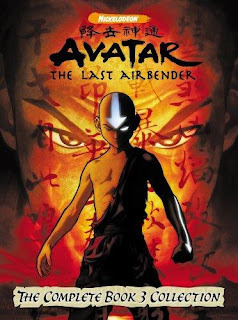 Avatar: The Last Airbender - Book III: Fire (****½) will be released on DVD in the USA on 16 September 2008 (individual volumes are available now), although once again no word of an official UK release, although a Region 1 import will be available. The Amtrak Wars to resume?